The aim of Turkey’s 2023 Vision Project, which coincides with the hundredth anniversary of the founding of the Republic of Turkey, is to bring the Turkish economy into the ranks of high-income countries. To reach this goal, strategies have been drawn up with a focus on the mid- and long-term future of the economy. However, the current state of affairs indicates that the Turkish economy has fallen into the middle income trap, and the key to breaking free of that is reconfiguring a model of growth that focuses on production. In light of that situation, the aim of the study is to provide a discussion of the trade policies and strategies that could be used to realize an effective model of economic growth. Jesus Felipe, Arnelyn Abdon, and Utsav Kumar. 2012. «Tracking The Middle-Income Trap: What is it, Who is in it, and Why?» Levy Economics Institute of Bard College Working Paper, 715; Erinç Yeldan, Kamil Taşçı, Ebru Voyvoda and Mehmet E. Özsan. 2012. Orta Gelir Tuzağından Çıkış: Hangi Türkiye? TURKONFED; Fernando Gabriel Im and David Rosenblatt. 2013. «Middle Income Traps: A Conceptual and Empirical Survey.» The World Bank Policy Research Policy Paper ; Gökhan Yılmaz. 2014. « Turkish Middle Income Trap and Less Skilled Human Capital.» Central Bank of the Republic of Turkey Working Paper. 2014. The Tenth Development Plan (2014-2018). Republic of Ministry of Development. Hendrik Van den Berg and Joshua J. Lewer. 2006. International Trade and Economic Growth. Armonk, N.Y.: M.E. Sharpe. Richard Grabowski, Sharmistha Self, and Michael P. Shields. 2007. Economic Development: A Regional, Institutional and Historical Approach. Armonk, N.Y.: M.E. Sharpe. Peng Sun and Almas Heshmati. 2010. "International Trade and Its Effects On Economic Growth in China." IZA Discussion Paper. Jeffrey D. Sachs and Andrew Warner. 1995. "Economic Reform and Process of Global Integration." Brookings Papers on Economic Activity 26 (1): 1-118. Jeffrey A. Frankel, David Romer, and Teresa Cyrus. 1996. "“Trade and Growth in East Asian Countries: Cause and Effect?" NBER Working Paper 5732. Jeffrey A. Frankel and David Romer. 1999. "Does Trade Cause Growth?" The American Economic Review 89 (3): 379-399. David Dollar and Aart Kraay. 2001. "http://www.sfu.ca/~akaraiva/e455/dollar-kraay.pdf ." http://www.sfu.ca/. Accessed November 11, 2014. Romain Wacziarg and Karen H. Welch. 2008. "Trade Liberalization and Growth: New Evidence." The World Bank Economic Review 22 (2): 187–231. ISNAD Gürsoy, Bilge , Diyarbakırlıoğlu, Kaan . "Trading Places: How Turkey Can Join the Rich, Using Trade Policy". 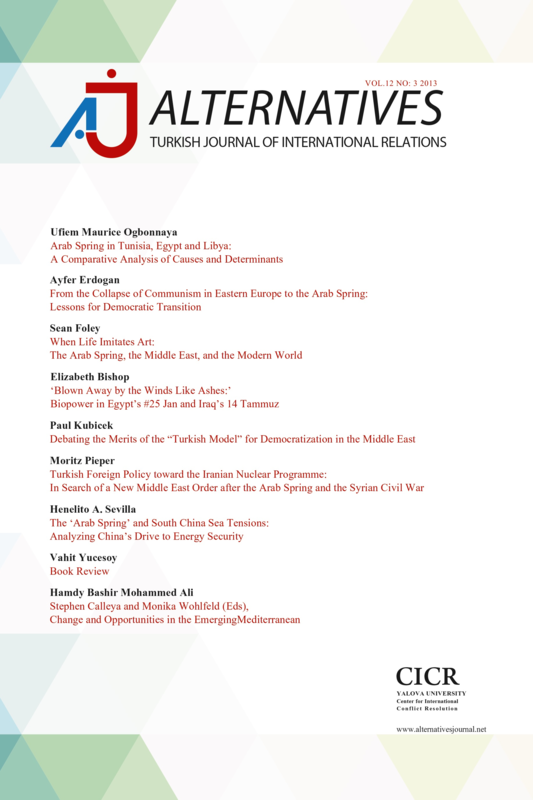 Alternatives: Turkish Journal of International Relations 14 / 4 (April 2016): 37-58.